These comments are frequently splashed across the Glassdoor pages of startups. It’s because navigating intense growth spurts is hard. On one hand, startups need people as fast as they can find them, but for longevity and morale, they also need to find individuals who fit and add to the existing culture, instead of slowly twisting it into something that’s hardly recognizable. There’s often an initial apprehension that comes from welcoming a lot of new hires into the fold. But there’s also something deeper. What these comments get at is the sense that there’s a certain “unscalable” spirit from a team’s earlier, scrappier days — and that each new addition represents a slow chipping away at the je ne sais quoi that forged the culture to begin with. As a leader, this can seem like an insurmountable challenge. How can you hire and scale quickly without losing the essence of your company along the way? Enter Josh Reeves, CEO and co-founder of Gusto, the payroll, benefits and HR platform for small businesses (which was known as ZenPayroll before its thoughtful rebranding process). Earnest, thoughtful and committed to values, Reeves has been impressively intentional while guiding his team from three guys in a house in Palo Alto to over 600 employees across offices in San Francisco and Denver, all in under six years. With a culture marked by warmth, approachability and a streak of character, Gusto has managed to stay true to its values and remain rooted in its traditions as it scales. And according to Reeves, their approach to hiring is a big reason why. 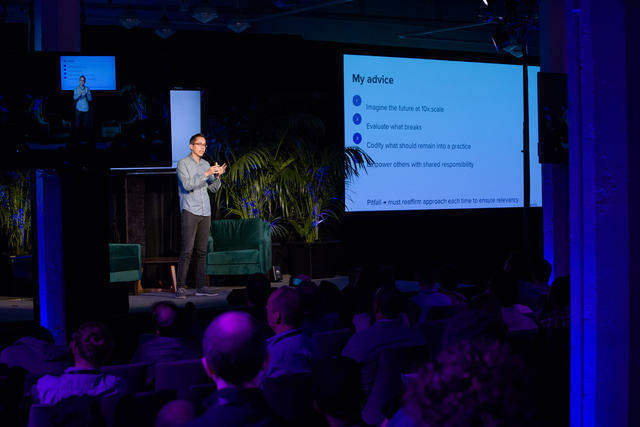 Inspired by his talk at First Round’s Founders Summit, Reeves shares here how Gusto scales the unscalable parts of hiring, detailing his hiring philosophy and walking through three examples of steps Gusto takes to retain its unique culture and ensure its best traditions live on. Alignment around values and motivation is what can really make or break hiring as you scale. To center its hiring process around this quest for alignment, Gusto has used three tactics, grounded in the traditions of what they’ve done since day one, but scaled up to their current size: conducting what they call ‘watermelon interviews,’ carefully vetting every single offer through a central hiring committee and turning offer calls into celebrations. ORIGINAL PRACTICE: CEO interviews every candidate to evaluate fit with motivations and values. SCALED PRACTICE: Carefully designed interview training program for employees that’s focused on values and motivations alignment, as well as a scorecard system for evaluating candidates. While values and motivation matter in hiring, it takes work to suss them out. But Reeves has developed a particular interview style that helps bring them to the surface. This process is now called the watermelon interview. That, of course, descends from another unconventional tradition. “When you join Gusto, you’re given a watermelon in your first few weeks. That’s because when we hired our first employee in the house in Palo Alto where we started the company, we happened to have a watermelon in the kitchen from our landlord, so we gave it to him as a welcome gift of sorts. And we’ve just kept doing that, so it seemed like a fitting name,” explains Reeves. Interviewing is a muscle — you have to train and practice to develop it. Reeves and his team set out with the goal of crafting a world-class interview training program. But first they had to identify what it was that they were training employees to look for. Assemble your interview squad. Get peers to nominate individuals who demonstrate your company values. Have a selection committee filter it down to who would be a good fit, with the aim of putting together a diverse group to represent the entire team. At Gusto, that means looking at interview experience and tenure, as well as team and location. Train them up. Hold an interactive training session, with role-playing and practicing. Create a bank of interview questions for the new interviewers to pull from and have them practice the interview on each other. At Gusto, interviewers might look for alignment in motivations by asking: “Tell me about the best job you’ve had or the best company that you’ve worked for. Why was it a great match for you?” To identify intellectual curiosity, ask: “What were you doing the last time you were daydreaming or looked at a clock and realized you had lost all track of time? What about that held your attention?” Reeves also likes to ask candidates what they’ve learned outside of work recently and why they spent time learning it. 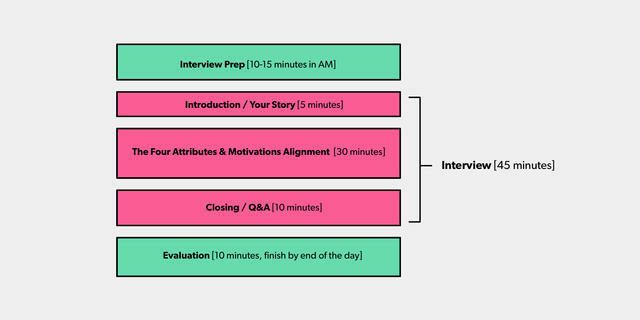 Outline how the interview should flow. Build a structure for the interviewers to follow, emphasizing the back and forth nature of the interview. At Gusto, this structure generally entails the interviewer asking a question and then being curious. Hone in on something in the candidates answer that you want to know more about, using phrases such as "tell me more" or "explain your thinking a bit" or simply asking "why." When the candidate gives a follow-up response, the interviewer can then transition to the next question, or choose to dive deeper into the original topic. Sometimes all four attributes can be explored through discussing just one story or project. Practice makes perfect. Make sure trainees do shadow interviews with someone who's already trained and practiced in the style. Then do reverse shadows, where the trainee takes the lead and someone listens in and gives them feedback afterwards. Go forth and interview. Graduate your trainees from the program and release them in the wild to conduct solo interviews. At Gusto, the commitment is a few hours of interviewing every week, on top of their normal day-to-day job. Importantly, Gusties are assigned to interview candidates for teams they will likely not be working with. For example, an engineer might interview a marketing candidate and vice versa. This practice ensures the interview focuses on values and motivation alignment instead of skills. Highlight the benefits of being a watermelon interviewer. In addition to playing a critical role in helping Gusto scale, each interviewer also hones their interview skills and builds connections with other parts of the company they might not interact with on a regular basis. Watermelon interviewers have also formed their own community inside the company, bonding and sharing tips with each other. ORIGINAL PRACTICE: CEO interviews every candidate to determine if an offer should be made. SCALED PRACTICE: A hiring committee of four individuals representing each part of the company spends an hour each week reviewing and signing off on every offer. Early stage founders are heavily involved with every single hire. They are in each interview from the beginning for obvious reasons, perhaps not even realizing that this provides a quiet undercurrent of consistency that steadies the ship. Then at a certain size, the founder’s plate gets more full, the pace of hiring picks up and suddenly it’s no longer feasible to meet with everyone. But it’s exactly when a startup is hiring quickly that things are most likely to get out of hand, especially without a centralized body to ensure at least some level of quality control. Take the alternative. At some fast-growing companies, hiring happens at such a quick pace that managers lose track of their candidates and hires. The hiring manager and recruiter help streamline the process by creating offer packets that give an overview of the role, the background of the candidate and include the interview scorecards. But as Reeves points out, there are benefits to this outside of simply saving time for the hiring committee. “If things are done correctly, all of these materials were already created as a part of the normal interview process. For a role to be opened, the hiring manager should have a clear summary of what the new hire will do. For the hiring panel to want to make an offer, there should be a clear summary of the interviews, with a debrief to reconcile any flags. And these materials should be used to help set up an onboarding plan for the new hire if an offer is extended and the candidate accepts,” he says. During their weekly meetings, the hiring committee spends the bulk of their time looking at the scorecards. “It’s about pattern matching, looking for consistent themes. But we’re also keeping an eye out for any flags or callouts. For example, if there was a ‘no’ recommendation on a scorecard, we want to make sure that the hiring panel discussed the flag in a debrief. Whether it’s through a team debate, a follow-on interview or a reference check, it’s important that the person who initially said ‘no’ has reconciled their response and is now okay with making an offer; otherwise the offer will not be made. This reconciliation is a key part of why we use hiring panels, instead of just having the hiring manager make the call on their own,” says Reeves. ORIGINAL PRACTICE: Entire company interviewed every candidate and joined the offer call, cheering and sharing why they were excited. Then the CEO walked candidate through the offer details 1:1. SCALED PRACTICE: Three to four members of each hiring panel join the offer call, everyone cheers and shares anecdotes from their interviews, then the hiring manager and recruiter share offer details with the candidate. When a team is small, every additional teammate has an outsized impact. So when a startup finds someone great after a carefully crafted process, it’s really exciting to make an offer — after all, it will potentially be a dramatic change to the team. But how can a startup maintain that level of excitement for the 501st person that an offer is extended to? But it wasn’t just a cheerleading session. After the initial wave of clapping and cheering died down, each team member then took turns speaking for a few minutes about a moment from their interview that resonated with them, sharing why they were so excited to have the candidate potentially join. Then Reeves would dart into a nearby closet to have a more private conversation about the rest of the offer details. Put some (structured) fun into your hiring panels. Create an interview panel of four to six people, depending on the role. Get three to four people from the hiring panel to join in on the offer call. When the candidate calls in, explain that other folks are in the room because you are all thrilled to make him or her an offer to join the team. At Gusto, that’s the cue for everyone to start cheering and clapping. Let everyone in the room go around and share how the candidate impressed them during the interviews. The specifics make a big difference in signaling you’ve found strong alignment. Then walk through the actual offer details more privately with the candidate. At Gusto, the hiring manager or the recruiter handles this part of the conversation. You should be stand-up-and-cheer excited about every single person you hire — so much so that you do just that. Startups need to be more intentional about scaling their culture and maintaining rigor in their hiring processes, particularly during periods of hypergrowth. To start, think of hiring as a search for alignment, not a way to boost your team size or a chance to grill prospective employees. Remember that companies don’t convince candidates to join, and candidates don’t convince companies to hire them. It’s a search for alignment on both sides. Try turning every offer call into a celebration, using it as an opportunity to express your delight at finding a great fit — and recognize all of the work that has gone into the process to find the right candidate. Introduce spot checks to make sure that the offers going out the door meet your standards. And whether you’re hiring at five or at 5,000, be thoughtful about the core elements of your hiring philosophy, working to codify them and train others to create a shared sense of stewardship of your culture. Look into the future. “Think about something you're doing today related to hiring, whether it's how you run your interview process, how you make offers or how you do reference checks. Then imagine doing that same exact process or structure at 10X the volume and try to figure out what in your current approach would keep working and what would break,” he says. Find out what you want to hang onto, capture it and give it to someone else. “You need to start thinking about what you really want to fight to protect as you grow. These are the traditions and practices you think are super important to keep. Remember that it’s not about doing it the exact same way you’re currently doing it though, but rather maintaining the philosophy and the ethos behind it," says Reeves. "Then try to create a practice around this thing to codify it. Isolate it down to the few sentences or bullets on what makes that element unique to your company. Then make sure that it's not something you own as the individual founder, because as the company grows, you'll quickly become a bottleneck."